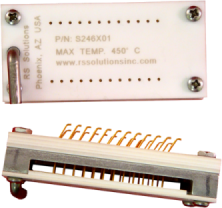 RS Solutions are your source for custom designed and engineered high temperature sockets. 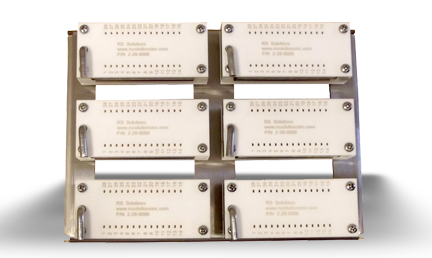 RS Solutions high temperature sockets are made from ceramic plates, stainless steel frame and gold over nickel plated Inconel contacts. These are Cam actuated sockets for ZIF (zero insertion force) loading. Our most popular socket is a Dual in Line (DIL), 28 pin, .600” (15.24 mm) wide, and .100” (2.54 mm) pitch. 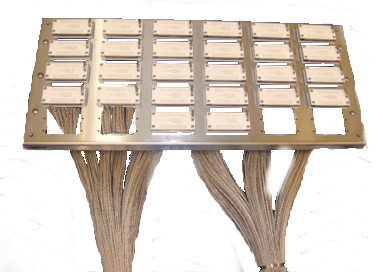 We also offer 24 and 40 pin configurations. Custom configurations are available. Standard sockets accept up to .020” diameter leads. 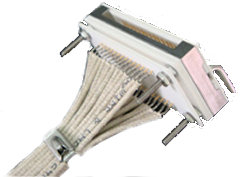 We offer a no risk test evaluation socket (28 Pin Standard Socket) for $285.00 ($454.00 for a wired socket) with a 90 day return policy for a full refund. Credit cards are accepted. Our sockets are durable – providing continuous use at up to 450C temperatures for multiple years. Customers report using our sockets at temperature for periods exceeding ten years. Our high temperature ceramic sockets are ideal for use in industrial test ovens. However, when a minimum connection length between the Device Under Test (“DUT”) and your bias hardware is critical. Sockets can be assembled on racks to be inserted into Industrial Ovens, with thermal wires fed thru ports in the ovens. The racks can be custom made to fit your ovens.